The VWR General Purpose -20 Freezer is a great choice for everyday freezer needs where precise temperatures aren’t a critical need. This lab freezer is reliable, and economical, with 20 cubic feet of storage, 4 fixed shelves and plenty of in-door storage space. The temperature range of this general-purpose freezer is between -15 and -25°C, that can be adjusted at the mechanical thermostat powered by a 1/3 horsepower compressor. The Epoxy coated steel exterior of this upright lab freezer resists corrosion, while the ABS plastic interior has coved corners for easy clean up. This energy efficient lab freezer is insulated with CFC free high-density urethane foam in both the cabinet and the door helping to maintain temperature stability with CFC free R134A refrigerant. Laboratory Freezer has been fully tested by our service team with a clean bill of health. Unit is a brand new scratch an dent model still in the original box. 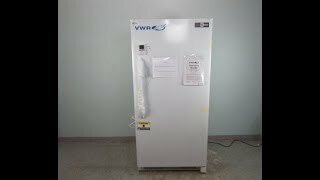 This VWR General Purpose -20 Freezer has been fully tested by our service team with a clean bill of health. Unit is a brand new scratch an dent model still in the original box. All of our lab equipment comes backed with our standard warranty. Should you have any questions about any of our lab freezers, please don't hesitate to contact us we're here to help.